Hiroyuki received his Ph.D. in Neuroscience from University of Tokyo where he worked with Dr. Toshiya Manabe to learn electrophysiology. He completed his postdoctoral work with Dr. Jeffry Isaacson in UCSD, where he learned in vivo imaging/recording techniques in awake, behaving mice. Hiroyuki started the lab in 2017 in the Department of Psychiatry and the Neuroscience Center at the University of North Carolina Chapel Hill. Elevated anxiety is the hallmark of many psychiatric disorders. This increase in anxiety is believed to be caused by dysfunctional neuronal circuits. Prior to joining the Kato Lab, Jose worked in the Garret Stuber Lab to determine how specific neuronal populations contribute to distinct anxiety-like behaviors. He moved to our lab in 2018 to continue his work on anxiety circuits in collaboration with the Stuber Lab, and to study how auditory inputs interact with these circuits. Koun received his Ph.D. in Life Science at the Graduate School of Biostudies, Kyoto University, in 2018. At Kyoto University, he worked with Dr. Tadashi Uemura to understand the cellular mechanisms of intensity coding in the fly nociception circuits. He joined the Kato Lab in November 2018 to study the dynamics of cortical recurrent circuitry. Amber received her Bachelor's degree in Biology at Butler University in Indianapolis, Indiana in 2016. At Butler, she studied the regulation of synaptic transmission in C. elegans roundworms. She also studied protein-protein interactions that drive apoptosis in cancer cells at Indiana University School of Medicine. Amber is a graduate student in the Neuroscience Curriculum at UNC and joined the lab in May 2017. Randall graduated from the University of North Carolina at Chapel Hill in 2010 with degrees in Mathematics and Biology. Prior to joining the Kato Lab, he started his project in the Garret Stuber Lab to decipher how prefrontal cortex and related subcortical areas coordinate behavioral states under conditions of stress using innovative approaches in imaging and computation. He moved to our lab in 2018 to continue his experiments in collaboration with the Stuber Lab. Destinee is a research technician and lab manager for Kato Lab. She received her Bachelor's degree in Psychology at New College of Florida in 2016. During her undergraduate years, she had the opportunity to work at Roskamp Institute, where she assessed visual dysfunction after TBI exposure under Dr. Scott Ferguson. Destinee has also been involved in work on the motor-sensory processes of wild and captive manatees with Dr. Gordon Bauer. Taha is a sophomore at UNC, and a volunteer intern in the lab. 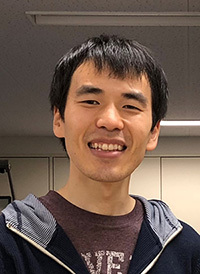 He joined Kato Lab in September of 2017. Over the summer, he had the opportunity to work at the NINDS, where he participated in research on cerebral malaria and the blood-brain barrier.